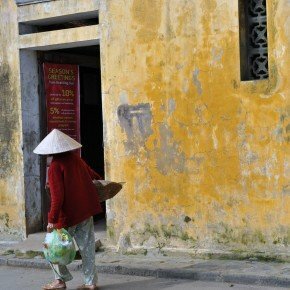 Being a bit of a foodie meant that a big part of our trip to Vietnam was for the cuisine. Fresh, zingy flavours bursting onto the taste-buds combined with mouth-watering herbs and the warmth of South East Asian spices was such a lure. 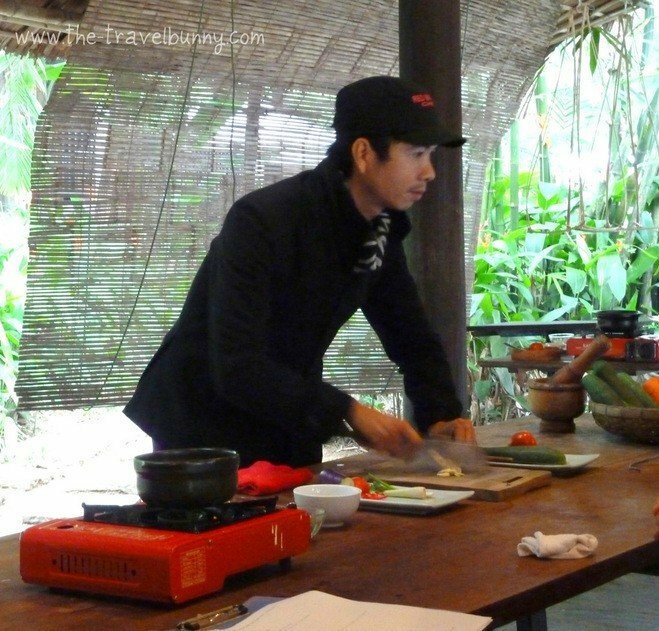 The Red Bridge Cooking School kept cropping up during our research so we booked ourselves on a half-day cooking class hoping to glean tips to help us recreate those tantalising flavours when we returned home. 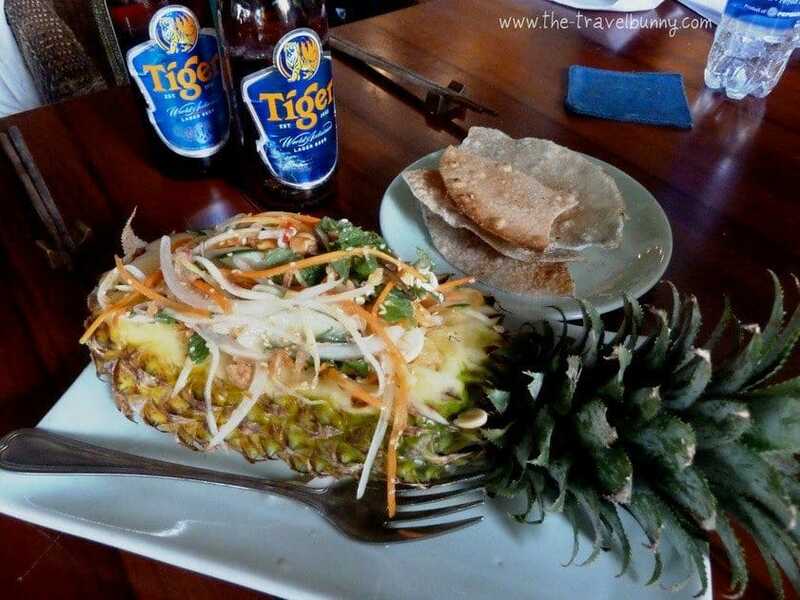 We were so glad we did – it was a mouth-watering highlight of our week in Hoi An. 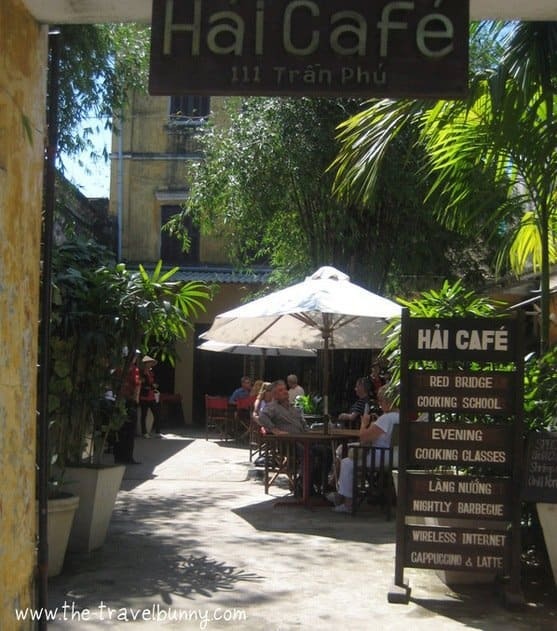 Our group met at 11am at Hai Café in the old town where we enjoyed a traditional Hoi An coffee. Strong, black and sweetened with condensed milk. We then split into groups of around 5-6 and walked the short way to market. 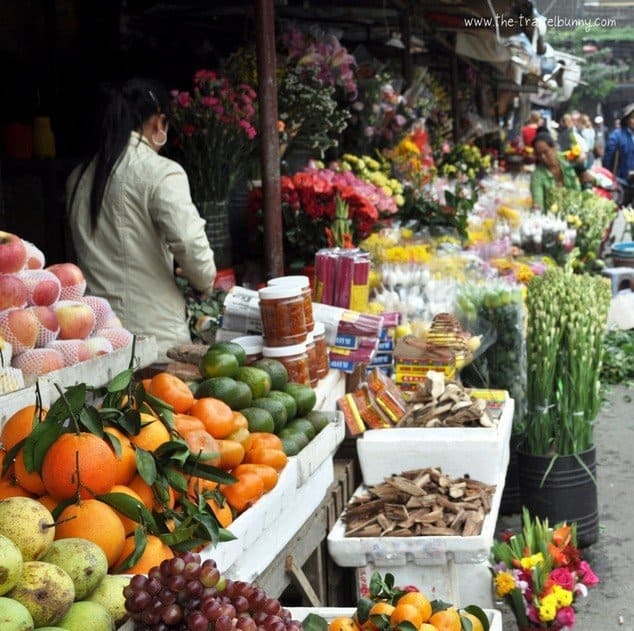 I could have spent hours wandering around soaking up market life but we had shopping to do and a meal to cook. 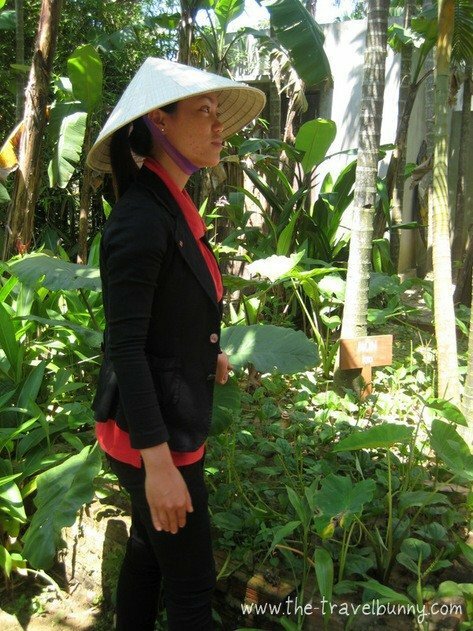 Anna, our guide us informed us about locally grown produce and some of its unusual properties – ginger is nature’s Viagra apparently and yummy means ‘horny’ in Vietnamese. The market is a wonderful mishmash of vivid colour, alive with chatter, noise and smells. Some good, some not so good. 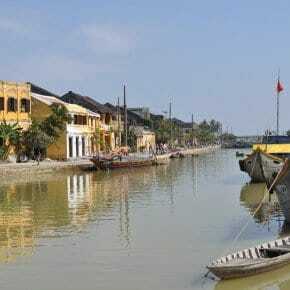 It’s a real slice of local Hoi An life. 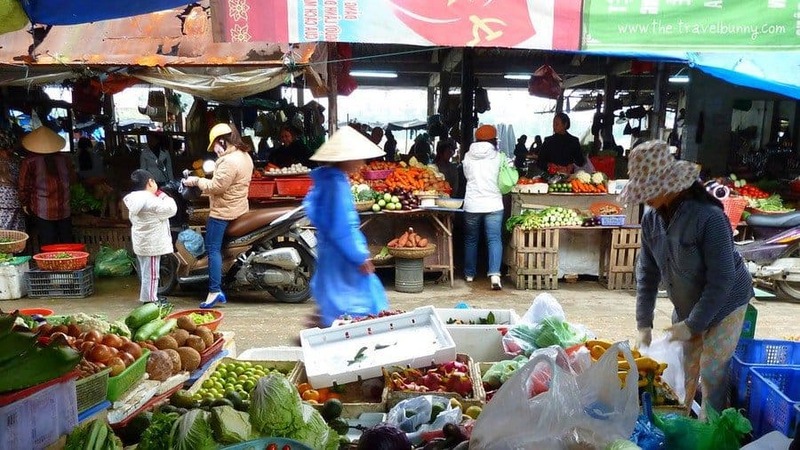 An abundance of vibrantly coloured fruit, herbs, vegetables together with freshly caught fish, meat and live-fowl can all be bought here and, if your recipe calls for it, bottled scorpion. Local people shop, sell, haggle, barter, gossip or just doze amid the melee. Next to the market is a small jetty where we boarded our boat for a leisurely half hour trip downstream to Red Bridge itself. 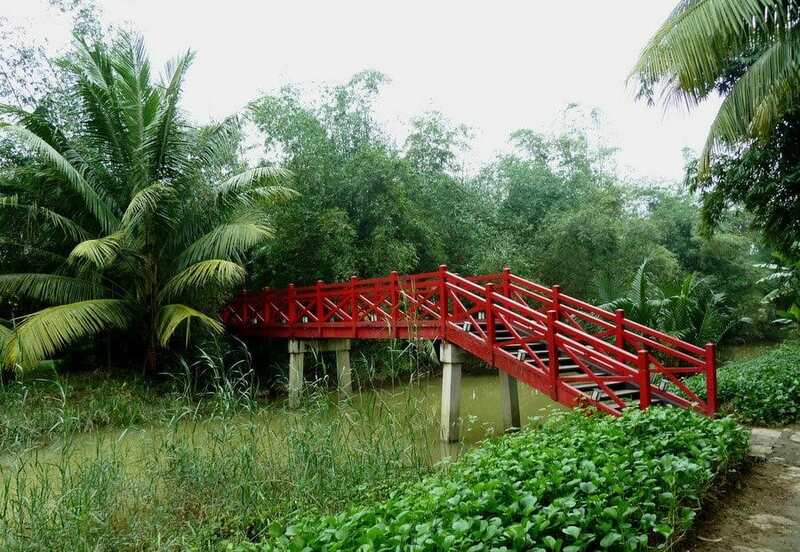 We passed fishermen casting their nets and lush, tropical vegetation along the banks interspersed with small huts and dwellings. On arrival at Red Bridge we were shown around the herb gardens where we learned more about the herbs we would be using. The distinctive aromas smelt delicious as we rubbed the leaves between our fingers. I’d love to grow these to use at home – Thai Basil, Vietnamese mint and lemon grass. After washing our hands we all headed for the outdoor pavilion on the river which was set up with individual cooking stations. Head chef Thân Nguyen demonstrated how each dish should be prepared – everyone had a great view of what he was doing with the help of an overhead mirror. A vital ingredient, humour, was added into the mix in large measures resulting in lots of laughter throughout the session. 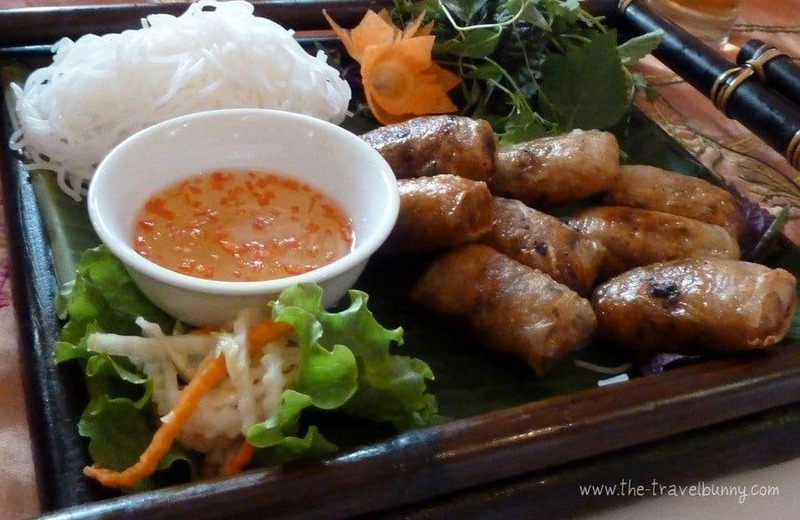 We prepared ‘Fresh Rice Paper Rolls of Shrimp’ which we ate there and then with a sweet chilli dipping sauce. Appetite whetted we went on to make hot Hoi An pancakes with shrimp, pork, and herbs rolled in rice paper and dipped in peanut sauce. Again these were savoured on the spot. 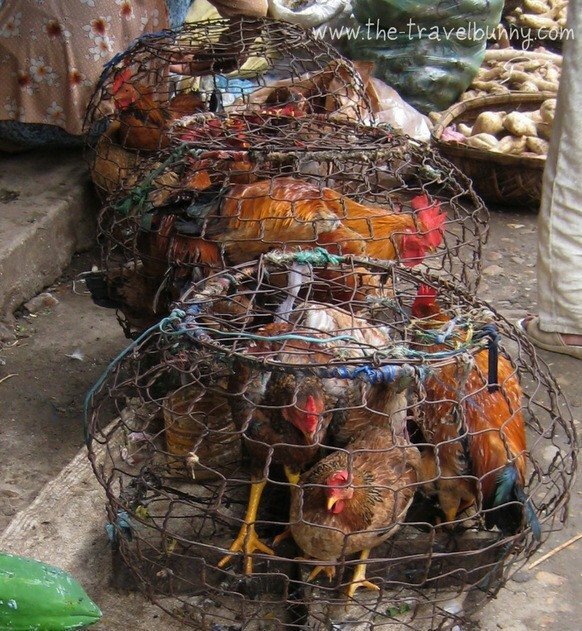 There are vegetarian options available for those, who in Thân’s words ‘no like meat, no like fish, no like this, no like that’. 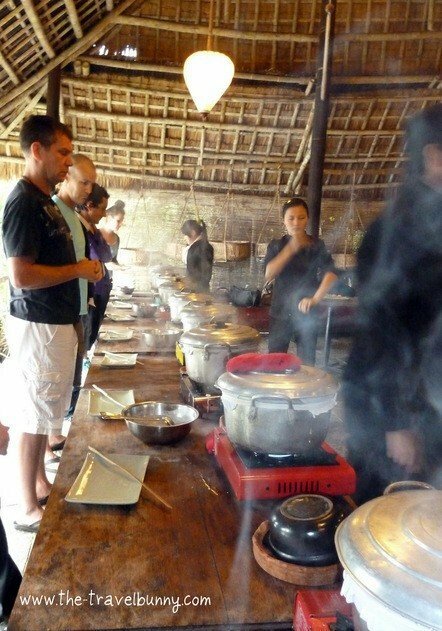 We a lot of fun preparing some delectable Vietnamese dishes, although I have to admit mine didn’t always look quite the same as chef’s (left) and I never did master the art of flipping my steamed rice pancakes but everything tasted delicious nonetheless. We dabbled with food decoration deftly transforming a humble tomato into a rosebud – well the others did, mine resembled, well, a peeled tomato. Back in the restaurant we enjoyed our culinary creations for lunch; Seafood Salad with herbs served in half a pineapple, Vietnamese Eggplant in a Clay Pot with rice and Steamed Ocean fish on a bed of fresh vegetables – the fish dish made for us in the Red Bridge kitchen – all were delicious. We were glad we’d heeded Thân’s advice – ‘you listen well you have good lunch, you don’t – you go home you try again’. I’d recommend to book in advance – it’s very popular. Cost is $33 per person including lunch. There are various timetables to choose from. Soft drinks are included in the price – beer and wine are extra. This is an enjoyable and fun trip for those that enjoy dabbling in the kitchen but not for those wanting serious instruction. What a great foodie experience, to go to the market, buy the fresh ingredients, and then cook and eat, right up my street ! Amazing photos ( even if the fan wasn’t yours!) Suzanne! 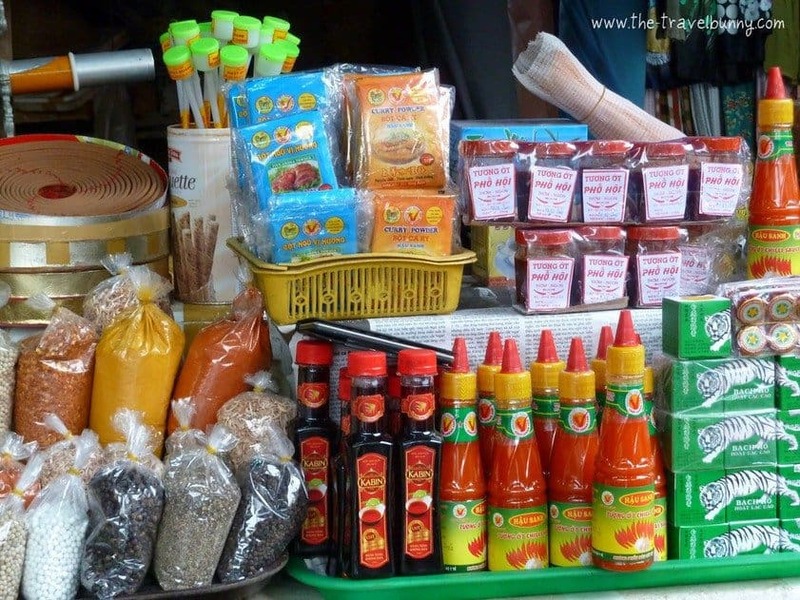 Love a good food tour – best way to get to know a destination and a lot of fun too! Chef was incredibly funny and the food delicious – despite cooking it ourselves! What an awesome experience that must have been! And such a great deal. 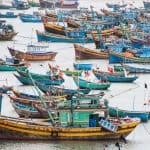 As another avid traveler I really like your blog and your fabulous photographs! Thanks Madhu that’s great to hear – all encouragement gratefully received! You can’t beat cold Vietnamese spring rolls with dipping sauce. Although I’ve not yet tried bottled scorpions! I’d be hopeless at it but it sounds a brilliant day out. Lovely post as usual Suze. so there is a bit of an incentive to produce something half decent! Oh my gosh, this post just made me so hungry. It sounds like you had a fantastic time! And I’ve tried to make those cucumber fans before — and failed. Good on you! 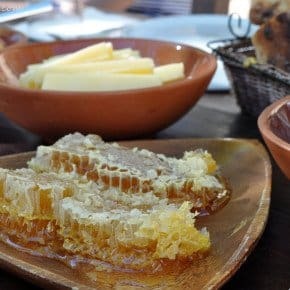 Vetnamese food IS wonderful – you might have noticed I like it! That sounded like a super excursion. Make sure you keep it up at home. I’m always intrigued at how ‘pretty’ Vietnamese food can look. I doubt that we will ever go back, but if we did I would love this outing. We had a fab time and it was good to do something different – especially as it was a bit drizzly that day. We’ve tried cooking it at home but it doesn’t come close! 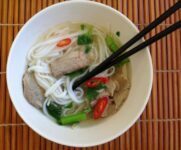 The nearest I have got to Vietnamese food so far is Kingsland Road (Pho Mile) in East London,but the more I read about Vietnam the more I want to go there. Looks fantastic! 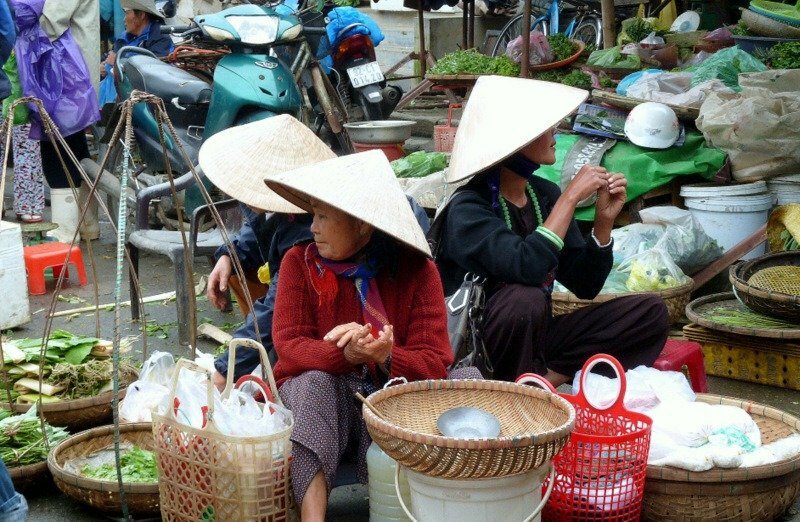 I love the market photos and remember having a go at rolling those fiddly rice paper rolls when I was in Hoi An! I could have spent hours people watching in the market – so much going on everywhere you looked. So colourful.